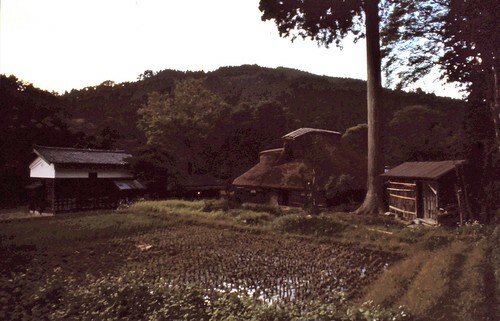 Even in the 1980s it was rare to see thatch still in use. Some buildings were vacant or derelict, but others remained in use, mostly in the narrow valleys far from the paved roads of the cities. This scene shows everything well maintained, both fields and buildings. February 1985 from 35 mm slides scanned in 12/2018. Press L for full-screen view; Z (or click the image) for full-file size view. Hover the mouse for pop-up annotations.